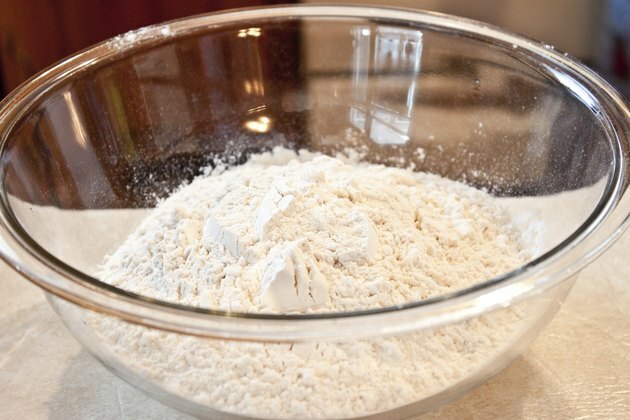 A bacteria-derived product, xanthan gum is commonly used as a thickening and stabilizing agent in both food and medicine. Because of its binding properties, xanthan gum can serve as a replacement for gluten in foods designed for people who suffer from celiac disease. Xanthan gum can cause migraines or skin irritation. Its side effects also include intestinal gas, flatulence, diarrhea and bloating. Increased exposure can make the symptoms worse. A 1990 report in the "Journal of Occupational Medicine" notes that people exposed to large amounts of xanthan gum powder, such as bakery workers, can experience flulike symptoms that include nose and throat irritation. Parents and caregivers should avoid feeding their infants xanthan gum-based thickeners, products or food. A 2012 article in the “Journal of Pediatrics” noted U.S. Food and Drug Administration warnings that products containing xanthan gum have been linked to illnesses and deaths in infants. The FDA now requires that over-the-counter medications containing water-soluble gums, such as xanthan gum, must have warnings about choking on their packaging. Choking -- caused by esophageal obstruction and asphyxiation -- can occur when these medications are not taken with enough water. Celiac.com: Could Xanthan Gum Sensitivity Be Complicating your Celiac Disease Recovery? What Are the Dangers of Methylparaben?